Join Germantown Municipal School District and the City of Germantown as they unveil their vision for the future to the public on Saturday, August 19th between 3:30-5:00 p.m.
Design dictates utilization. The new, state-of-the-art facility at Riverdale School is the catalyst for instructional shifts in the school district. GMSD has partnered with the City of Germantown and assembled a design team of faculty, parents, and teachers, engaging the very people who would one day use the building. The result achieved was a structure prepared for a whole new level of student participation with an aesthetic unlike any other in GMSD. 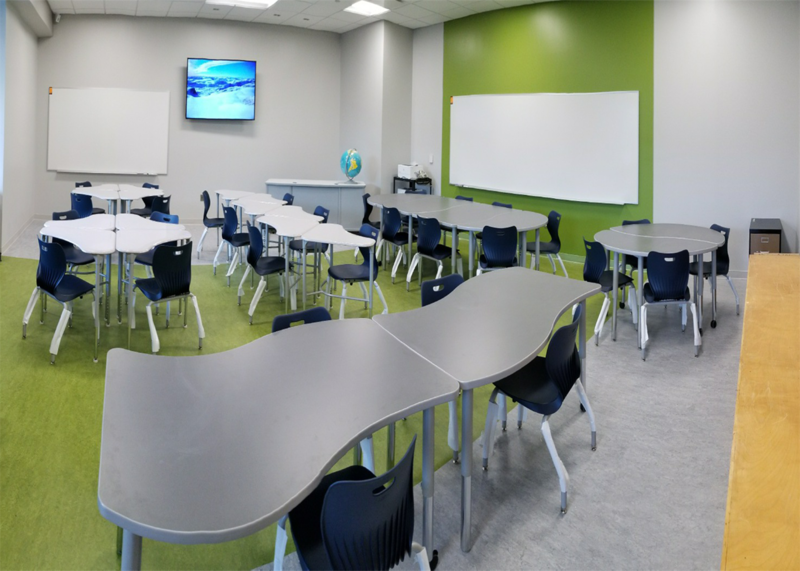 “This building will lead the district into the 21st Century with its multi-use grouping tables for individualized instruction, chairs of different sizes and purposes, genius bar stools, and network infrastructure accommodations for its one-to-one computer initiative,” says Superintendent Jason Manuel of some of the new features of the facility. These technological resources allow for a move from teacher lectures to student-centered experiences and, ultimately, growth in learning. The contemporary educational programs at the Riverdale addition don’t stop with technology. It also provides several unique learning spaces. Cutaways with bench seating allow small groups of students to collaborate in the hallways. There is an outdoor amphitheater overlooking the school’s natural rain garden and a mixed-used science and STEM lab. The landscaping itself even provides some teachable moments, according to Manuel. Notably, the fine arts spaces are also being transformed. A visual arts facility with an outdoor patio for painting and a pottery kiln is large enough to allow for community use, while choral and instrumental music are being equipped with practice rooms, storage, and sound proofing. The design of the school, through a mixture of brick, glass, and metal materials, also lends itself, not only to education, but to sustainability. “We wanted to build with the future in mind,” said Manuel of the project’s eco-friendly features. Glass hallways adorn both sides of the school, and every classroom has a bay window with views of the surrounding landscape that lets both natural light and beauty into the building. New LED lights allow for teachers to adjust settings in various ways, creating a light better for both the environment and learning. These inventive designs, coupled with the motion-activated heating/air, will also save the district on utilities. The team is working again to plan design of a new elementary school. “After that,” Manuel says, “we will begin looking at projects to bring our current schools up to the new standards”. “We want our schools to be cutting edge, producing 21st Century students, who are engaged in the process and doing meaningful activities, because that is where we believe true learning occurs,” said Manuel. For the past twenty years, Riverdale has supplemented its student growth with twenty-three outdoor portables. Within its first three years, GMSD determined that these portables be replaced not only with a “brick and mortar” solution, but a building equipped to bring advanced learning resources to both the school and its students. 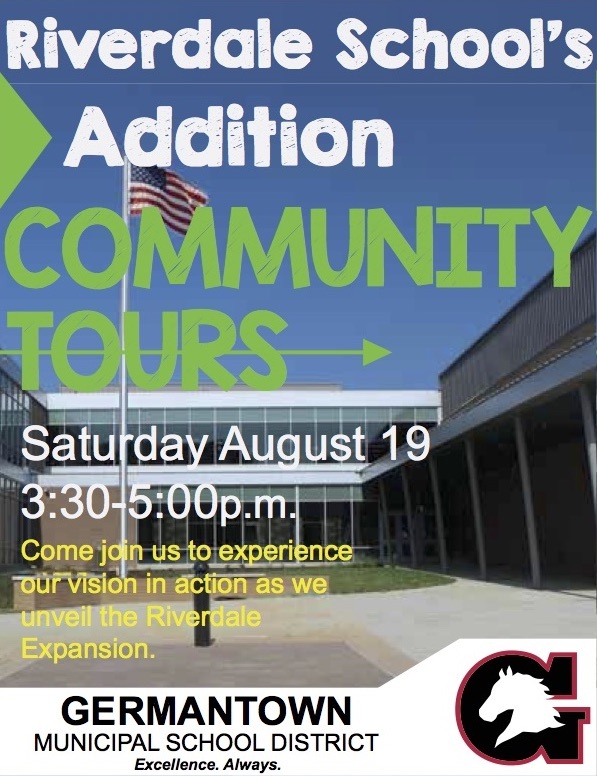 The building will be open to the Germantown community and members of the press from 3:30-5:00pm on Saturday, August 19th. Both guided and self-guided tours will be offered.